Animals are just as much hassle as children......hence the reason why I have neither! Finian and Marese headed to Turkey last week and the dilemma was, what to do with Ruby and Daisy, their dogs. Emma and Niall (their children, and therefore less important) would be away all day and not back til evening. Mam lives next door so would be able to let the dogs out. Bet you sang that bit! Ruby could be left on her own, but not Daisy. As you may recall, Daisy is the one who had to be put on Valium for a while as she was experiencing a phantom pregnancy. Not the type of creature you would trust on her own for any length of time. Hence the reason why Daisy is always put into the kennels to be looked after while her Mam and Dad are away! It was left to Emma to bring Daisy and get her settled in her foster home. Now everyone takes Daisy to be a bit of a canine bimbo with not a lot of brain power. Well she obviously has more that we give her credit for! When she rounded the corner and saw the kennels, she stood rooted to the spot. Then she wriggled and squirmed until she got her head out of her collar. She took off like the hammers of hell! All Emma could see was a blur in the distance. 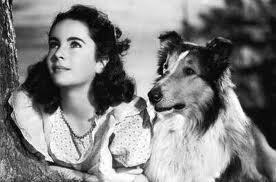 Now I'd like to be able to blog about the fantastic Lassie-esque adventures she encountered on her way home. Acts of heroism like saving a drowning child from a fast flowing river or pulling another unfortunate child up the side of a jagged cliff are way beyond Daisy's capabilities. Also the fact that the kennels are just 300 metres down the road from her house limited the possibility of anything exciting happening to her on the " long trek" home. with Captain Plum and a dagger! "You can't seriously be making me go back there". She gets out next Friday!